Appledore is a tiny village with a big heart, famous for its shipbuilding, fishing industry and maritime history. We must also acknowledge the bravery of the Appledore Lifeboat crewmen who, since 1829, have been rescuing those in peril off the North Devon coast from what is now the RNLI Lifeboat Station at West Appledore. The village history and sea-faring traditions have been well documented by local historians such as David Carter whose book "Illustrated History of Appledore" chronicles the history of the sea-port village from the earliest historical sources to the present day, The book includes many original illustrations and approximately three hundred old photographs of the village taken over the past century. We suggest you start your exploration of this delightful place from the top of the village by visiting the North Devon Maritime Museum on Odun Road. From here you can walk down to the quay via Bude Street. The village is a labyrinth of narrow streets which run down to Appledore Quay and stretches out along the Torridge estuary towards the notorious Bideford Bar and the open sea. Appledore is positioned neatly at the confluence of the River Taw and the River Torridge with spectacular views over the estuary to the "Uplands", the Commodore Hotel and the North Devon Yacht Club at Instow. From the Lifeboat Station slipway there are views across to Braunton Burrows now part of the UNESCO North Devon Biosphere Reserve. As in olden times, the Quay is still very much the heart of the community and is bustling with activity at high tide when sailing ships, yachts, gig boats and other craft scurry to and fro'. Local fishermen still moor alongside the quay to sell their daily catch straight off the boat and if you are lucky you will see a massive ocean going ship on its way to unload cargo at the ancient port of Bideford. Fishing and crabbing off the quay is still a favourite pastime for families and fishing trips for sea bass and mackerel can be booked from the Quay Cabin or the Sea Chest on Market Street who also sell marine chandlery. While you are here search out the art and craft galleries, gift shops, tea shops, restaurants and pubs tucked away in the narrow streets. For those who enjoy eating al fresco try some traditional fish and chips from "Sylvestors", just up the lane beside the Seagate Hotel, they also sell fresh local fish and shellfish. A visit to Appledore would not be complete without tasting local Hockings Ice Cream which has been made in Appledore since 1936. Their brightly painted vans can also be seen in Bideford, Westward Ho!, Ilfracombe and Torrington. During the summer there are some fantastic fundraising events, festivals, fayres and fun days, including the Appledore Summer Festival, Appledore Carnival, Appledore and Instow Regatta, West Quay Fun Day, Appledore Lifeboat Open Day, Appledore Pilot Gig Races and the Appledore Book Festival. Sadly the Appledore Visual Arts Festival ended in 2013. The oldest building in Appledore is Docton House on Marine Parade and is now home to Docton Court Gallery which holds exhibitions from local artists at different times throughout the year. 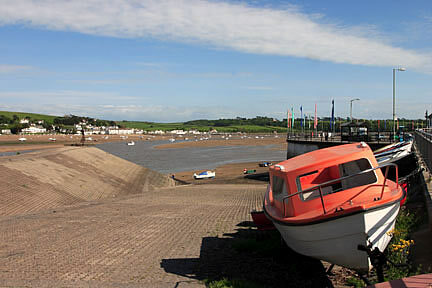 The ferry service that had existed between Appledore and Instow for more than two centuries was withdrawn in September 2007 but was happily reinstated in 2011. 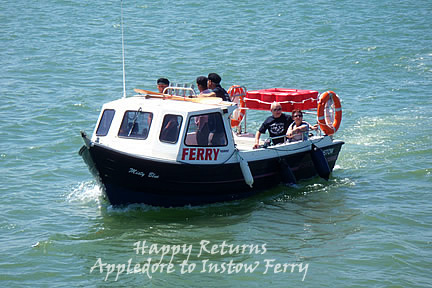 The new Appledore to Instow Ferry has been running daily since June and will continue until the end of October. The very first ferry ran from Braunton in 1639. Time and tides did not stop the postal service and from about 1849 to 1939, in fair weather or foul, letters from Appledore were ferried across to Instow . Today the Post Office can be found at "Johns of Appledore" on the Quay If you want some action away from the village Skern Lodge at Watertown holds Adventure Days for all ages and abilities with fun activities including surfing, high ropes, kayaking, coasteering, abseiling, archery and power boating. There are some less strenuous walks to Bideford and around the Northam Burrows Country Park at Westward Ho! You can find out about guided nature walks from the Northam Burrows Visitor Centre. Walkers, sheep and horses share this common land with golfers from the Royal North Devon Golf Club, the oldest links course in England. There are three miles of golden sand at Westward Ho! more than enough room for families, surfers, wind surfers and kite buggy enthusiasts. The Tarka Trail is enjoyed by walkers and cyclists all year round.